Looking for a late-summer tournament to play in at one of the nicest resorts in the Southwest? Look no further, as one of the most prestigious yearly adult tournaments in the Southwest. 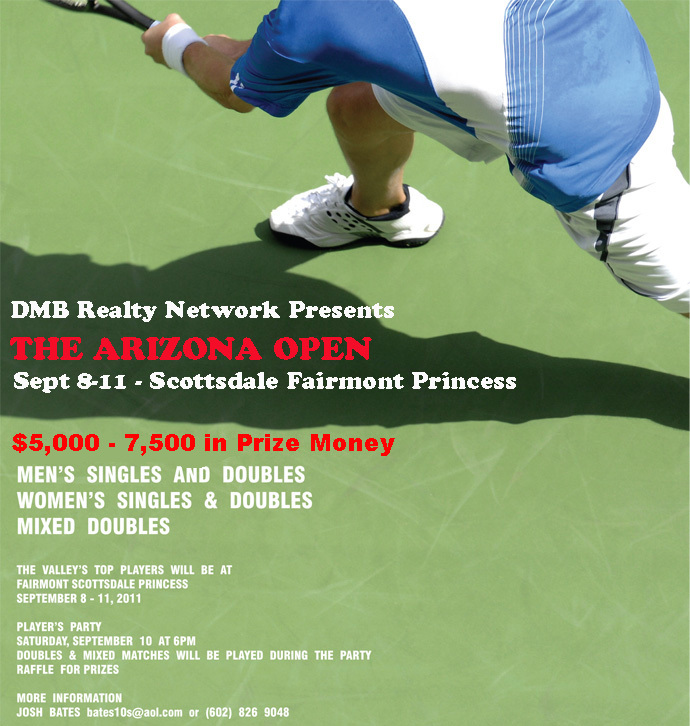 This year's DMB Realty Network Arizona Open will be held September 8-11 at the Fairmont Desert Princess in Scottsdale, the previous home of ATP and WTA Tour events. This is a prize-money event (total purse between $5,000 and 7,500) featuring some of the best players from the Southwest and United States, but it is open for anyone to participate, even junior players! Play against top-level players to gain experience or just mix and mingle throughout this four-day, top-level tournament, which is also a Level 3 event for Adult players in the Southwest. With guaranteed prize money from the quarterfinals on, consolation rounds, and a luxurious playing spot at a AAA Five-Diamond Resort, why not take a swing as it's sure to be a fun event. There will be 2011 US Open viewing on-site throughout the tournament (since it's held during the last four days of the Grand Slam), so you won't miss a thing. Other sweet tournament amenities will include the use of the Scottsdale Princess facilities like the pool, locker room and Willow Stream Spa, a sweet Adidas tournament shirt, and much more that will ensure a player experience you won't forget! Entry Fee: $48.88 for singles. $28/per player per event for doubles. Entry deadline: September 1, 2011 at 11:59 p.m. Host Hotel: The Fairmont Scottsdale Princess is a AAA Five-Diamond Resort located in the heart of Scottsdale at the base of the majestic McDowell Mountains. The resort is the past home of the ATP's Franklin Templeton Classic (1987-2005) and WTA Tour's State Farm Classic (2000-2003). World No. 1 and tennis legends like Andre Agassi, Lleyton Hewitt and Serena Williams have played and won here. The Annual PGA Tour Waste Management Phoenix Open, one of the highest-annually attended PGA events each year also calls the Fairmont Princess home. With luxurious rooms, uncomparable views, two championship golf courses, the award-winning Willow Stream Spa (rated one of the best in North America by Travel & Leisure Magazine), four award-winning restaurants as well as amenities galore throughout this 8-acre property, you'll have a blast at this tournament. We have secured a terrific player rate per night at this hotel ($119/night + taxes). The scenic views and amazing amenities alone will make this a truly unforgettable experience. The John Austin Center for Tennis at the Fairmont Scottsdale Princess has seven newly-resurfaced US Open blue hard courts that are top of the line. With great viewing areas and playing location (located just off Scottsdale Road and the 101 Highway) this is an easy-to-get-to location in a beautiful part of Scottsdale. The facility is run by former Wimbledon mixed doubles champion, John Austin. Some early-round play and some consolation rounds will also take place at Scottsdale Ranch Park, an award-winning, 18-court public facility that has been home to some of the Southwest's top events in the past, including this year's US Open National Playoff-Southwest Championships. A player party for tournament participants will take place on Saturday evening, September 10, sponsored by USTA Southwest. All tournament players are invited. Several tournament sponsors have already jumped on board to be a part of this magnificent event, including the host property Fairmont Scottsdale Princess, Bates Tennis Services, which is putting on the event, All About Tennis, Adidas, Wilson, Clif Bar, PostNet and USTA Southwest. With court signage, player shirt branding, on-site booth set-up and other marketing opportunities available, this tournament can showcase your business. To become a tournament sponsor, please contact tournament director Josh Bates at bates10s@aol.com.